about this book: Walking Among Humans was inspired by my mom's love for aliens coupled with my distaste for aliens annihilating or enslaving mankind. There seemed to be a supreme shortage of friendly aliens in the world - not counting the ones on shows like Star Trek, Babylon 5, etc., so I decided to rectify that with this book. Walking Among Humans was originally published in 2016 in memory of my mom, who adored the book and begged endlessly for me to publish it already. I finally did it. So, if you are tired of aliens trying to take over Earth, or of reading books and watching movies that portray all sentient life from across the cosmos coming to enslave or annihilate mankind, then this book might just be for you. While it was originally written for Young Adults, readers of all ages can enjoy this book. • "This is a fast paced fantasy book with some romance." 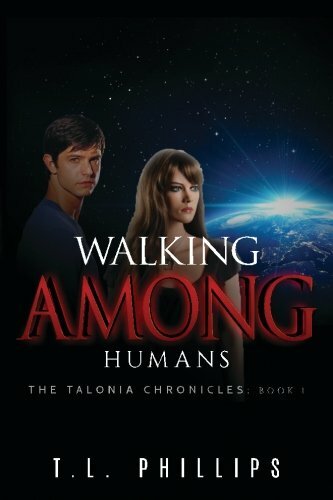 • "…hard to put down…"
• "Finominal book loved it"
I hope you enjoy reading Walking Among Humans as much as I enjoyed writing it. Happy Reading!